Passwords. We all have them, and most of us struggle to remember them. Sometimes we do things that we know aren’t the greatest idea, like placing our computer password on a post-it note under our keyboard. Ok, we don’t do that here at Valiant, but it’s definitely something we’ve all seen before. It’s completely understandable; the average person has 19 passwords. Pew Research Center conducted a study in 2016 that yielded some scary, yet expected, insight. Passwords are often the first line of defense between your information and individuals who want it. They form the wall between your private information and people who want to benefit from it, yet we do very little to ensure that our passwords are strong because they can be a real pain to remember. 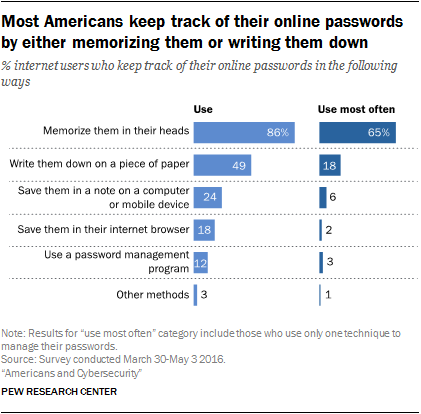 Just look at the numbers – the vast majority of people Pew surveyed memorize passwords or write them down on paper, neither of which are good practices to manage your passwords. I can barely remember when to buy milk, and that’s just 4 letters long. How am I going to remember a 16-character password consisting of lowercase and uppercase letters, a number, and a special character or two? I’m not, because I don’t have to. I use a password manager. Password managers are a secure way to store the passwords for the various services you use online. From your Amazon account to your login for your bank, storing your passwords in a manager so you don’t need to memorize or write them down means that you can use passwords that are much more complex, decreasing the likelihood of them being discovered. LastPass is a great option, and was one of the first well-rounded password managers. Not only does it store your passwords, but audits them to help you begin to use stronger passwords, and can even automatically change a password for you if a service has been compromised. 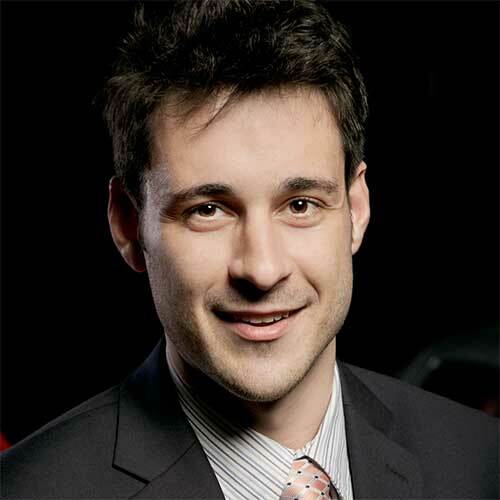 In order to keep your password vault secure, LastPass supports two-factor authentication as an added layer of security. LastPass is available for Windows, OSX, Linux, Android, and iOS, and has plugins for all major Web browsers. Dashlane has been around for some time, and has become a real contender in the password management ring over the past couple of years. Aside from the common password management features, Dashlane also keeps track of online orders, lets you share documents, and more. KeePass is an open source password manager and offers a higher level of control over your passwords than LastPass and Dashlane. KeePass’ password vault is stored on your computer or mobile device, always under your control. Many password managers offer cloud-based storage, which make some people uneasy. I mean, it makes sense; who wants their passwords floating around in a cloud? Another advantage of KeePass is that it’s a portable app, making is easy to move from one device to another. There are also many plugins available for KeePass, allowing you to select the functionality you need, and nothing you don’t.